The 18th anniversary of the opening of the ‘new school’ by Councillor Val MacIver – At assembly pupils and staff were reminded by Mr Hulme that this anniversary would take place on Sunday 30th September. Glasses were raised on the day! Duke of Edinburgh’s Award – Two more pupils have received their Bronze Award at assembly. Well done to Caitlin Johnston (S5) and Innis Taylor (S4). Staff Departure – Mairi Beeson leaves Gairloch High School after three and a half years. Mairi has worked with the High School and associated Primary Schools as Children’s Service Worker. Although part time, Mairi has had an enormous impact on early intervention and helping to promote the smooth transition for Primary 7 pupils to High School. She has forged excellent relationships with parents and pupils alike. At recent interviews with S1 pupils, many pupils commented on the Resilient Kids programme they have been involved with in PSHE. This was set up by Mairi and has helped to promote emotional literacy in S1. We will all miss her service, her professional manner and her determination to get things done. Work Experience – All S4 pupils have now completed their week of work experience. We must thank Mrs Flora MacKenzie as without her sterling efforts this would not happen. She works tirelessly for weeks beforehand making sure the proper paper work is in place thereby allowing the Council to allow the placements. 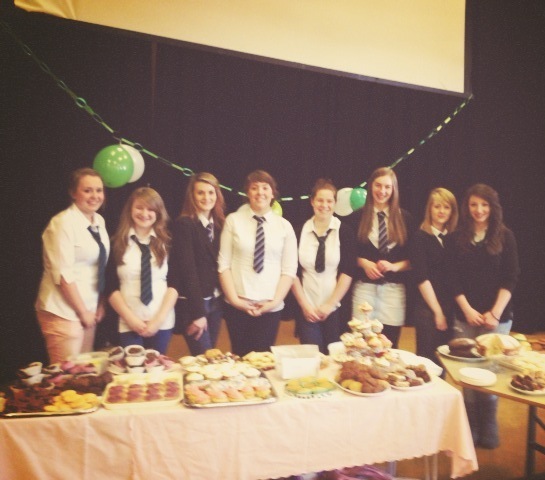 MacMillan Coffee Morning – £450 was raised on Friday 28th September by girls in S5 and S6 for the Cancer Charity. Organized by Sophie Davies in S5 the group provided a coffee morning for members of the community and then a cake sale for staff and pupils throughout the day. Well-done girls! Click on the photo to see more images from the day. Jeans for Genes Day – This annual event took place on Friday 28th September. Jeans for Genes is a charity that aims to improve the lives of children with genetic disorders, care for their families and invest in research. Pupils (and staff) had the opportunity to wear their jeans to school in return for a contribution towards this worthwhile cause. A total of £220 was raised and a cheque has been sent off. Golf Competition – This inter-house competition on Thursday 27th September was the fourth annual golf event. The number of pupils putting their names forward for the event has increased each year. This year the number was capped at 36 (four starters at each hole for a shotgun start). The pupils play to a Stableford Scoring system. All of the pupils managed to play the nine holes. The winning house this year was Tollaidh, Maree came second with Kerry in third place. Highest score and winner of the trophy, which will be presented at the annual prizegiving, was Joseph Smith, S3. Runner-up was Callum Vickerstaff, S6. Adam Blyth, S5, made his mark with a hole-in-one at the 7th hole. Gairloch Golf Club kindly give us the exclusive use of the course for the afternoon and donated the trophy awarded to the player with the highest score. John Beck, Treasurer of Gairloch Golf Club and also the Junior Convenor, makes all the arrangements at the Club and works out the results from the scorecards. The Club arranges the loan of clubs for those pupils who do not have their own. All of this accumulates into a great gesture of support from the Golf Club to the development of golf in the school. The Golf Club also offers tuition courses to youngsters following on from the First Club Golf which John Shearer, Active Schools Co-ordinator, delivers to all P5 pupils in early spring. Many thanks to John Shearer and John beck for the time taken to organise this event and others. Wild about Gairloch – As part of this festival, the Hospitality pupils played host to a number of visitors. Husband and wife team, Catriona and John from Food Business Development, along with Pete More (SNH) and Margaret Wiseman, delivered a relevant ‘wild food from Gairloch’ experience. Children learned food preparation skills and how to plan menus and recipes using seasonal, local produce. 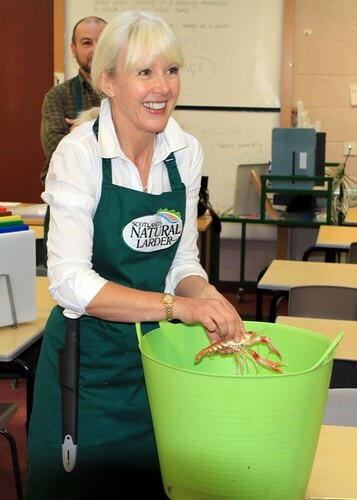 The pupils prepared langoustines, sampling venison burgers and steaks, wild rabbit pate, preparing crab to plate and finally a blackberry and apple cranachan dessert. Click on the photo to see more images from the day. Catriona – The enthusiasm and engagement of the pupils made our job easy and enjoyable. We came away with positive responses from all who were involved. Thank you for making us so welcome. The school would like to thank all involved and in particular Scottish Natural Heritage, the organizers and funders of this event. Culture Club & Higher English trip to Eden Court – On Tuesday 2nd October a group from the school travelled to Inverness to see a production by Aberdeen Performing Arts of “The Cone Gatherers”. This play, adapted by Peter Arnott from the Robin Jenkins novel set on a Highland estate during the Second World War, was an unexpected mix of music, song, visual effects and dance. The group who went consisted of the current Higher English class, who have studied the novel in some depth, but also included six S3 pupils, who have attended most of Ms Gulliver’s Culture Club events over the past year. The design was striking, the production lively, fast moving and the performances by the cast very convincing. Some characterisation, however, was significantly, even controversially, different from the original and so provided the Higher class with much food for thought and discussion, focusing their minds on important details of the text in preparation for exam work. Altogether a worthwhile and memorable trip! Thanks to Miss Mackison for organizing this visit to the Theatre. Blythswood Christmas Shoebox appeal – The school will be supporting this Christmas Charity event again. Leaflets for the Blythswood Christmas Shoebox appeal have been distributed. We invite all staff, pupils and members of the community to fill a shoebox with various sundries, wrap it up and deliver it to school for export to children less fortunate than ourselves. Further information available from the school or the Blythswood website. Deadline for collection from the school is Monday 5th November. Study Club – Study Club for the S4 Prelims will run after school 3:30-5:00 p.m. on Tuesdays, Wednesdays and Thursdays in weeks beginning October 29th, November 5th & 12th. S4 Pupils will be issued with a timetable for these after-school events on their return to school next week. Important Dates –Available here on the website. Art with Artists – Three artists from the Ceangal International Residency visited GHS during the week commencing Monday 17th September. S1 were extremely lucky to get the opportunity to work with these talented artists; Anish Ahlulwalia from New Delhi, Sarah Olson from New York and Vicky Stonebridge from Lochcarron. Miss Gulliver also came along and enjoyed working alongside the pupils. The artists were working on a theme of ‘wishes’, incorporating nature into their work in different ways. Their intention was to include the work of the pupils’ along with their own. Vicky and Anish worked with S1A. The pupils made paper with Vicky, some of the pulp was made from peat and the pupils decorated their paper with leaves and berries. Anish gave his groups rhododendron leaves and asked the pupils to decorate them and write some special wishes on to them. Later in the week, Anish intended to put the leaves into a creel along with others from his project. This creel is on display outside the GALE Centre as part of the Ceangal Exhibition. 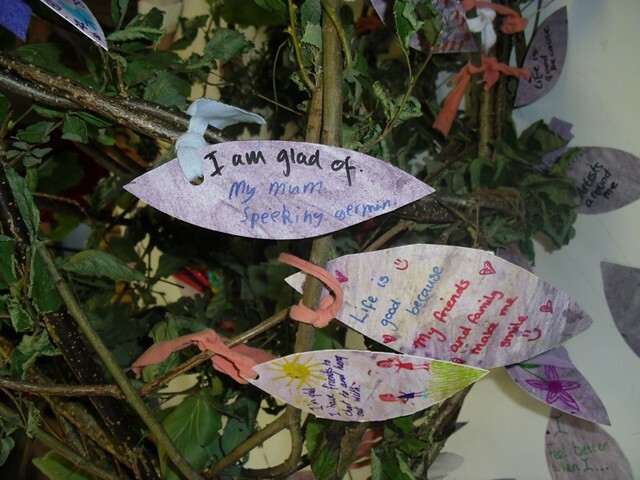 Vicky had a little ‘wishing tree’ with her and asked the pupils to make paper leaves recording things that they felt grateful for in life. They were then tied on to the tree and suspended from it. Some of the comments from the pupils were most endearing! There are photos on the website that can be seen by clicking on the photo above. When Sarah came in to work with S1B the pupils made little plastic flowers from recycled bags that were attached to plastic bottle tops. Sarah would then attach the colourful flowers to a rope, alongside others that she had made. The pupils threw themselves into this interesting work and thoroughly enjoyed the experience. They did a review after the event and here are some comments from the pupils: Overall I had a really fun time with Anish and Vicky making paper and writing on leaves. I can’t wait to see what the paper looks like when it’s dry. Lauren MacDonald. We spent about an hour and a half on this project and my favourite part was definitely putting my wish on the leaf. Jasmine Connop. Overall, I found the activities very enjoyable, but my favourite activity had to be paper making. I liked the paper making because I enjoyed making the paper look pretty. Hannah Wood. The last workshop I did was when we wrote our wishes on rhododendron leaves that were all put in a lobster creel; I wrote that I wished for world peace. Overall, it was a very interesting, fun and different lesson. Caitlin Mitchell. SCHOlympics – A total of 1356 students competed for ’gold’ in the SCHOLympics Quiz by answering a wide range of questions from the subjects covered in the on-line Heriot Watt University SCHOLAR Programme during the period of London 2012 Olympic and Paralympics. Fraser Hinchliff and Callum Vickerstaff (both S6) are two of the senior pupils in Gairloch who make regular use of Scholar materials to support their studies. The boys decided to take on the challenge of the quiz. They achieved first and second place nationally out of the 1356 entrants. Fraser got a score of 86 out of 88 winning a £75 Amazon voucher. 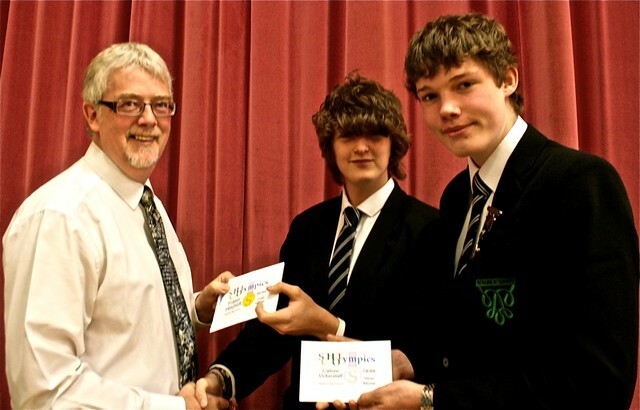 Callum received a £50 Amazon Voucher as runner up. Both were presented with their award at assembly. Well-done boys! Comenius Greek Evening – On Tuesday 25th September, the Comenius group organised a Greek evening, to celebrate this year’s trip to Greece. Innis Taylor, Ciaran Alexander and Holly Morrison presented their own slideshows of images and opinions about their experiences, and how great an opportunity it was for them all. On display was a wide range of Greek artefacts and posters, presented by Mrs. Browne. After a slideshow of all the activities of the week, the audience was treated to a marvellous array of Greek food, prepared and served by Miss Thistlethwaite’s Hospitality classes. Mrs. Campbell and Miss Hunter would like to thanks pupils’ families, friends, relatives, members of the community and staff at Gairloch High School for all their support and encouragement during the last 2 years. This prestigious Comenius project will be hard to follow, but it is hoped to see the school involved in another project in the near future. In the meantime, please check out the Comenius Project Website http://www.ourcompeniusproject.wordpress.com that has displays of the work that pupils have completed over the past 2 years. Creative Ambassadors 2012/13 – Eden Court Theatre are looking for an “ambassador” from every Highland secondary school to advise their Creative Team on delivering dance, drama and digital media across the region. The ambassadors will have opportunities to meet with actors, dancers, directors and behind-the-scenes crew from world class performances, and will receive complimentary tickets to several shows. They will act as a link between the theatre and the school. The young people involved will participate in meetings, pass on information and gain experience supporting and promoting events. Luke Gorman, S5, has volunteered to take up this role in its first year, and we’re looking forward along with him to seeing the impact this new initiative will have in the school and the community. Important Dates – Available here on the website. 24th October – Pupils return to lessons. Phone System – From the middle of August until mid-September our phone system was not working. The system has now been replaced and, we hope, normal service resumed. We discovered that although our phones were not ringing or indeed working, callers were hearing the phone ringing out as if unanswered! Apologies for any inconvenience caused.